The RC100 is inexpensive and small, but not one of the faster M.2 drives. Toshiba's RC100 may not be the fastest SSD around, but it's the only M.2 NVMe drive in a 2242 form factor. Toshiba has been in the SSD business nearly since the beginning, and the Toshiba RC100 is the latest addition to the company's extensive portfolio of SSDs. It aims to bring M.2 NVMe performance to the mainstream SSD market, sitting between the current OCZ RD400 (faster M.2) and OCZ TR200 (slower SATA) product lines. But price isn't the only factor, as the RC100 goes with the less common and more compact M.2 2242 form factor. If you're building a NUC or upgrading storage in some laptops, that smaller package may be the only selling point you need to see—Newegg for instance doesn't show any other M.2 2242 PCIe SSDs, with the only other M.2 2242 options using a SATA interface. (2242 if you're wondering is for 22mm x 42mm, the dimensions of the drive area.) If I've missed some other SSD, let me know, but otherwise the RC100 is currently the only 2242 drive that uses PCIe. Toshiba's secret to packing up to 480GB of NAND into a 22x42 mm package is that it stacks the controller and NAND into a single chip. Here's a quick overview of the three capacities launching today. Like many other NAND manufacturers, Toshiba is moving to 3D NAND, which it calls BiCS (Bit Cost Scaling, if you're wondering). 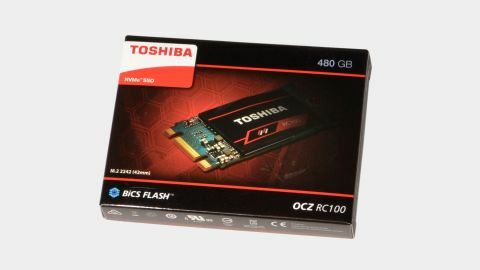 The RC100 uses 64-layer TLC BiCS NAND, with an in-house designed controller that we don't know much about other than the core specs Toshiba gives in the above table. The result is some of the lowest official prices I've seen on NVMe drives of similar capacity. So far so good, but what's the catch? There are several. First, the RC100 lacks any DRAM cache, opting to use Host Memory Buffer (HMB) to keep performance up. The RC100 also uses a PCIe x2 interface, meaning maximum theoretical throughput tops out at around 2GB/s—not that it really matters here, since the drive is only rated for lower speeds. And speaking of speeds, note that all the results in the above table are "up to" values, which means in some cases you'll see the drives fall well short of those marks. The lower capacity drives have lower performance as well, and a higher cost per GB. Toshiba pegs the RC100 as an in-between option compared to its RD400 and TR200 SSDs, and on paper the specs look about right. The cost per GB is higher than the best values for SATA SSDs, particularly on the lower capacity models, so I'd recommend sticking with the 480GB model if possible. That will give you the most storage, the highest endurance, and the best value, and it's only moderately more expensive than a good SATA drive. So let's look at how the RC100 performs. I've highlighted the RC100 in the charts in green, with the SATA 860 Evo 500GB included and highlighted in red to show how one of the fastest SATA drives fares. All the remaining drives are NVMe models, mostly M.2 2280 though a few use AIC (add-in card) form factors. There's some variation in capacity based on what I received for testing, with 480-512GB being the current 'sweet spot'—though 1TB-class drives are becoming increasingly common and attractively priced. The SSD benchmark suite consists of a mix of theoretical and real-world metrics. Other tests are also run both to condition the drive and to ensure there are no oddities, but for the charts I focus on CrystalDiskMark, IOMeter (mixed read/write performance), file copying, and PCMark 8 Storage. I take the results (in MB/s) from eight of the tests and give each equal weighting (ie, geometric mean) to come up with the aggregate score. While it's impossible for a single number to tell you everything you need to know about an SSD, it provides a good high-level view of what to expect. In terms of overall performance, the Toshiba RC100 sits near the bottom of several charts, with QD1 random write performance at the very bottom. But it's the IOMeter mixed random IO result that's particularly painful, and it really drags down the overall ranking of the drive. I retested the RC100 in IOMeter multiple times and contacted Toshiba to discuss my results, but the current firmware consistently chokes on the intense random IO testing. The IOMeter testing consists of five minutes of sustained 100 percent IO, varying from 100 percent reads to 100 percent writes, with three intermediate steps of 75/25, 50/50, and 25/75 read/write ratios. The sequential results look okay, but the random results are terrible. While this sort of load isn't something you're likely to encounter in real-world use, particularly with a budget SSD, it does raise a red flag. If a brand new RC100 can drop to sustained throughput of only 20MB/s, what will the drive performance look like in two years? The 32.5MB/s IOMeter random average is the worst I've seen from almost any SSD. The only drive that did worse in this test is Toshiba's SATA TR200. But how much does this one result matter in the big picture? Home users aren't running 100 percent random IO workloads, unless they're running benchmarks for fun (yeah, I do that too). The most difficult task you might throw at an SSD in regular use is to copy a bunch of files from one folder on the drive to another, and the RC100 does okay in that test, almost double the performance of the best SATA drives. But among NVMe SSDs, it never rises above the bottom third of the charts (except for the CrystalDiskMark QD1 read result, where it falls in the middle). My take: the heavy random IO testing is useful information, but not the most important metric. It's intended to push drives to their limits, and the RC100 clearly has issues with such workloads. The RC100 is an interesting drive, mostly because of its form factor. I don't have many devices where I can't use an M.2 2280 SSD, and for standard desktops there's really no need. In fact, the compact design may have a higher potential to throttle due to temperatures in some situations, like if it's under a hot graphics card. I checked for throttling in my IOMeter tests by aiming a fan at the SSD, and performance didn't change much, but the drive is clear of other heat sources for my tests. Anyway, if you have a laptop or NUC and you can only use a 2242 form factor M.2 drive into it, you're stuck choosing between M.2 SATA and the RC100. The RC100 is also reasonably priced, particularly compared to other M.2 NVMe drives. The cheaper alternatives like the Kingston A1000 and Corsair MP300 are drives I haven't tested (yet), and the specs look relatively similar to the RC100. I have tested the Adata SX7000 512GB, which is the only NVMe SSD that's slower than the RC100, and it's also the least expensive M.2 NVMe drive around. But let's talk about the RC100 price a bit more. Officially, according to the latest information from Toshiba, the prices are as shown above: $60 for 120GB, $80 for 240GB, and $155 for 480GB. However, those prices are lower than the initially planned prices of $65, $95, and $190. Toshiba likely saw the drop in SSD prices and changed the recommended pricing for the RC100 accordingly. If you look at Newegg, the current prices match the initial MSRPs, and the same goes for Amazon. Those prices should drop to reflect the revised MSRPs, which will make the RC100 far more compelling. At the current prices, unless you really need the 2242 size right now, you should wait or get something else. My biggest concern with the RC100 is that despite seemingly decent specs, the sustained random IO performance is very low. That may not affect most users at first, but the whole point of NVMe drives is to break past the SATA bottleneck. The RC100 certainly does so when it comes to sequential throughput, and many common workloads are closer to sequential than random IO in nature. This is also a value-focused drive, so talking about continuous read/write speeds may be a bit unfair. What's important to understand is that long-term, how a drive behaves under stressful situations when it's new will often reflect on how the drive performs a year or two down the line. It's difficult to test long-term performance and reliability for SSDs, and it's impossible to come to any meaningful conclusions about long-term results after just one week spent with a drive. However, weaknesses in areas like sustained random IO can often resurface even for light use once a drive has been in use for a couple of years. Hopefully Toshiba can improve things with future firmware updates, and maybe the drive will continue to work just fine outside of torture testing for years to come. Toshiba SSDs are generally reliable, and they're used in many OEM PCs, but they're often not the fastest solutions. Overall, the primary virtue of the RC100 is that it's the only PCIe NVMe M.2 2242 drive currently available. If you need that for a laptop or SFF PC upgrade, great. You can also add 10 points to the score in that case. But if you don't need the small size, which includes most desktop and laptop users, there are better alternatives.